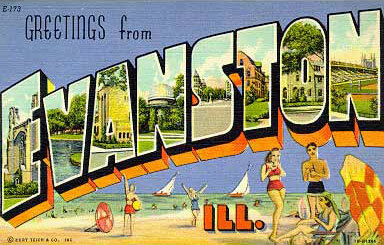 Detachment for the ears – Greetings from Evanston, Ill.
At work , the communication is non-stop. I have three projects on the resource calendar right now, and that calendar is just for the official projects. Colleagues — all wonderful people — talk to me all day. At night and on weekends recently, I feel like I’ve become even more escapist. On weekends, I sit in my new living room, let the sun stream onto my beloved blue couch and read without music or television or voice in the background. When traffic outside gets too loud, I shut the porch door. I miss the current good breezes when I do so. The silence is centering. On nights after work, pure silence is too much of a switch from the day, so I keep the music going. But what I’m playing these nights is… I struggle to explain it. The music I’m playing has an internal space. A world spins up inside it. The artists are hardly alike except they have an alternative day inside, waiting to spring into action and replace the one at present. Rodrigo Y Gabriela, Torito, the first track off their new album. Rod Stewart, Hungry Heart, from 1984 but released in a new box set No Depression told me about. I have no video for it. The best media I can give you is a Spotify link. The tune is of course one of Bruce’s. But Rod, close to his prime, walks around the song’s world and takes up gentle residence. Chuck Ragan, Non Typical, off his new album.